Star Wars: The Force Awakens - Sequel Or Remake? | Warped Factor - Words in the Key of Geek. Star Wars: The Force Awakens - Sequel Or Remake? Matthew Kresal feels a familiar awakening in the force. As I write these words, The Force Awakens is into its second week of release here in the United States. It has broken box-office records not just here but around the world and is well on its way to potentially becoming the highest grossing film of all time. Not just that, but it has largely received praise from fans and critics alike for being the best Star Wars film in more than three decades. All of which is a good thing, surely? Listening to Edelstein, I found his assessment rather harsh. Yet despite his harshness, I couldn't help but wonder if he had a point. After all, sitting in the cinema on the Thursday night the film started playing, I detected echoes of A New Hope in the film I was seeing. Is it fair to call The Force Awakens a beat by beat remake of it? To answer that, it's important to define the difference between a remake and a sequel. To be fair, the line between the two can be blurred at times (see how a number of James Bond films have basically reused the same plot over and over again). A remake though, on the surface at least, takes something that has already been filmed and makes it again. For those feeling like Hollywood does nothing but do that again and again these days, it's worth mentioning that filmmakers have been doing this for almost as long as feature films have been around. Universal for example remade The Phantom Of The Opera in 1943 that it based on the earlier 1925 silent film. The epic 1963 film Cleopatra is a remake of the earlier silent 1917 film made by the same studio. Further, a remake is different from a reboot as can be evidenced by the difference between the 1989 Batman film directed by Tim Burton and the 2005 film Batman Begins directed by Christopher Nolan. A sequel on the other hand is a different beast entirely. It is a continuation of a previously existing work. The Dark Knight, to use an aforementioned example, is a sequel to Batman Begins and continues the story started in that film. Prior to 2006, the James Bond films were all technically sequels to one another, though they rarely acknowledged that fact. It was only post 2006 that the Bond films became more apparent sequels to one another with Quantum Of Solace following on Casino Royale and, more recently, Spectre picking up on events from Skyfall. 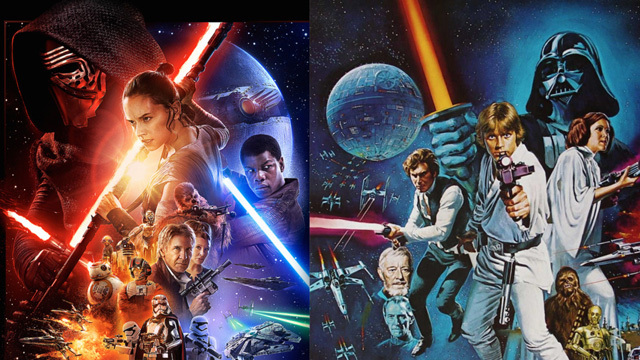 With the two previous Star Wars trilogies, the films had been sequels (or prequels, films set before the events of the original trilogy but the latter two films of that trilogy continuing on after the events of The Phantom Menace). So with the definitions defined, which does The Force Awakens more closely resemble? Remake or sequel? Or a mix between the two perhaps? 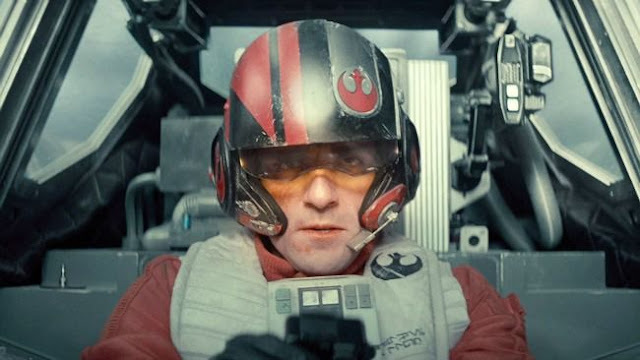 There are certainly echoes of A New Hope in The Force Awakens. Both feature protagonists on desert planets coming into the possession of a droid that continues something being sought after by the film's protagonists. There's a close escape from said desert planet, mentors to the protagonist and the destruction of planet(s) that establishes the threat of the antagonists super weapon. Then there's the death of the mentor figure aboard the super weapon as well as an epic space battle that manages to just destroy the super weapon in the nick of time. Strong echoes indeed but does it constitute Edelstein's claim of “beat by beat remake of the original film”? The differences here are as important as the similarities. The desert planets in questions aren't the same one and the protagonists are (at least of time of writing) quite different from one another. 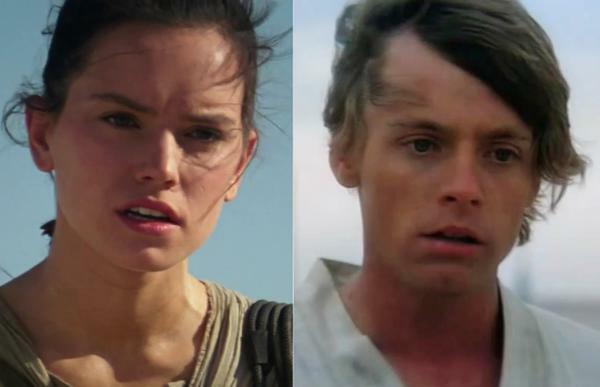 Luke in A New Hope is keen to escape while Rey in Force Awakens is keen to stay where she is. Whereas Luke is keen to do something with the information he's been given by R2-D2, Rey seems reluctant to take BB-8 on to begin with, and even once she becomes involved in the adventure at hand is still keen to go home again. The mentors to Luke and Rey (and Finn too for that matter) come in at different points in each film's plot and their subsequent deaths come for different reasons and in different circumstances. Those are the major differences but what about elsewhere? It is certainly true that the super weapons in question and their destruction are more than a little familiar. 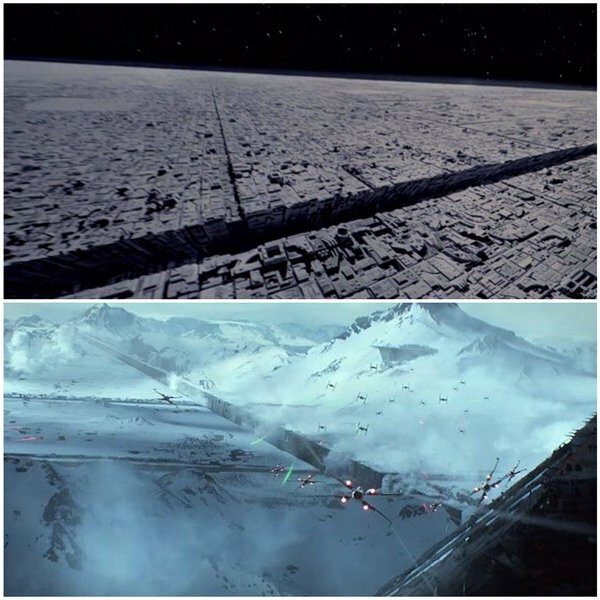 Starkiller Base can fairly be seen as, and called out as being, a larger version of the Death Star. For that matter, the film itself rather makes the point of calling attention to this fact in a briefing scene leading into the final battle. The final battle itself manages to find ways of differentiating itself from the 1977 film, though both involve a lot of X-wing fighters trying to destroy a small target, flying down a heavily defended trench before one pilot finally manages to complete its objective. Here perhaps the film is guilty of the criticisms from Edelstein. Once again though, the differences are as important to remember as the similarities. The film introduces a number of new characters and elements, often variations on things both from the original films and the now largely discarded Expanded Universe. The character of Finn for example has no very obvious parallel with a character from A New Hope, though the role of the character can arguably be combined with Rey to form a version of Luke. Han Solo, the rogue space pilot of A New Hope, has taken on the mentor role while the rogue space pilot role has shifted somewhat to Poe Dameron whose X-Wing piloting skills also call to mind Luke from A New Hope. Echoes are there but so are differences. What The Force Awakens has done is arguably what George Lucas himself did with the original film in 1977. Lucas built, by his own admission, on pre-existing ideas and archetypes from Arthurian legend to the Buck Rogers serials that were old even by that standard. Lucas mixed together elements of science fiction, history and mythology to spawn something familiar yet fresh and exciting. What Abrams and all involved did with this latest Star Wars film is apply the same principal to Star Wars itself, something that, in a meta-fictional way, seems entirely appropriate. Which brings me back to another of Edelstein's comments, this one about the prequel films. In the months leading up to the release of The Force Awakens, it would seem that those much derided films have been getting a reexamination of sorts from fans and perhaps the larger public as well. From my readings, which are perhaps limited, it appears that a slightly new view of that trilogy is taking hold. The view is that the larger arcs and storyline of the prequels (the fall of the Republic and the downfall of Anakin Skywalker) were intriguing but not as well told as they might have been. This is down to a combination of factors from casting to the writing and direction of George Lucas. Why is this important? Perhaps because, whereas the original trilogy seemed to focus more on emotion with its storytelling, the prequel trilogy tended to focus more on explaining and filling in gaps. The story of an epic tragedy that was built into the prequels was instead lost in the midst of continuity filling and CGI spectacles to create films which had largely lost what made the original series so endearing and iconic: its heart. What the powers that be behind The Force Awakens have sought to do was to go back to that and return the films to their roots. In the end, The Force Awakens has a far greater claim to being a sequel than a remake. While being a sequel, it also manages to do what many reboots try and fail to do: find a way of making the familiar new again. It was what Star Wars did nearly forty years ago with A New Hope and what the generation that watched that film is now doing with The Force Awakens. It does so without being a slave to what came before but using that as a basis to build upon. In doing so, audiences young and old alike can come to this tale set “a long time ago in a galaxy far, far away” and enjoy it for what it is. What more can we ask of it?